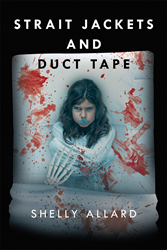 Author Shelly Allard’s New Book “Strait Jackets And Duct Tape” is a Humbling Life Journey Filled with Haunting Secrets, Painful Thoughts, Dread, and Self-Realization. Recent release “Strait Jackets And Duct Tape” from Page Publishing author Shelly Allard is the author’s life and times, her wretched childhood, patterns of abuse, self-loathing, and finally what lead her to clean up, dry out, and find self-worth. Shelly Allard, a survivor of domestic and childhood abuse, has completed her new book “Strait Jackets And Duct Tape”: a gripping and unbelievable tale of horrors survived throughout a life of torment and severe mental illness. This book is about the life of Shelly Allard. Through her life, Shelly has been molested, raped, and mistreated by all those who were supposed to be protecting her. Due to this, she turned to drugs to ease the pain, which caused her to lose her children, turn to a life of prostitution, and made her homeless. She also has many mental health diagnosis, including a split personality named Roxanne. After 27 years of drug use, she finally pulled her life together and got sober. She has a home, food to eat, clothes to wear, and she is building a new relationship with her estranged children. She also has the love and support of a man who made her his wife. She wants to show people that no matter what you have been through, you can make positive changes, and live a good life. It is possible to change the outcome of the life one lives. Published by New York City-based Page Publishing, Shelly Allard’s engrossing tale leads the reader down a terrifying path of recurring childhood abuse and how she created a split personality to endure the pain and molestation. Shelly shares the torments inflicted upon her by the demon who attached itself to her and filled her head with poison and refused to let her forget her past and move on. Shelly also reflects and shares her greatest accomplishments and moments she is truly proud of. The story is one of haunted secrets, shameful tendencies, painful thoughts, agonizing dread, debilitating mental illness, but most importantly one of self-discovery and self-improvement. Readers who wish to experience this astonishing work can purchase“Strait Jackets And Duct Tape” at bookstores everywhere, or online at the Apple iTunes store, Amazon, Google Play or Barnes and Noble.